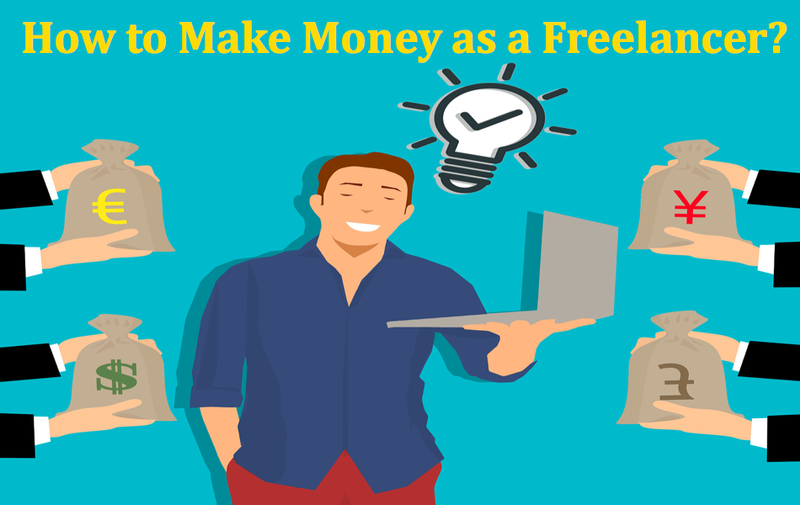 Home » Website Building » Make Money Online » How to Make Money as a Freelancer? Employers worldwide are trimming the number of employees on payroll, over the last decade. Reasons for this reluctance to hire full-time staff are many: High salaries and perks demanded by experienced professionals, complex labor laws and economic upheavals that strike global economy sans prior warning. Instead, growing number of small and large companies now look to freelancers to work on short, medium and long-term contract basis. It saves them money as well bother of paying a plethora of perks mandatory under labor laws, such as medical insurance, retirement benefits and overtime, among others. A 2016 study, “Freelancing in America” clearly highlights the growing trend of freelancing. In 2016, whopping 35 percent of America’s workforce- or- about 55 million workers are freelancers. Collectively, they earned over US$ 1 trillion, says a joint study conducted by leadng freelance work portal, Upwork and America’s Freelancers Association. Europe accounts for almost an equal percentage of freelance workforce according to a study by Payoneer, a global payments gateway provider as well as employment statistics compiled by the European Commission. These figures amply prove, freelance jobs rapidly becoming the preferred source of income for people across the world. For those aspiring to work as freelancers, we provide a few vital tips and tweaks that can help you make money. This is a golden rule that most would-be freelancers flout. Leaving fulltime employment to work as freelancer may sound great. Indeed, there are intrinsic benefits of working as freelancer since you have flexibility of working at will. However, holding on to fulltime job before entering the freelance market has inherent benefits: Firstly, it ensures your regular income. Secondly, you gain vital experience and develop a network of contacts while employed. And finally, mentioning your full-time work lends a lot of credibility to job searches as freelancer. With growing popularity of remote or telecommute jobs, you get flexibility of working from any place and often, at your convenience. Before taking freelance jobs, find telecommute work in your field. Telecommute work pays well and often can help you acquire and improve your existing skills. Further, you benefit from a fixed income that negates any uncertainties posed by freelance work. Before leaving fixed jobs, find if your skills are in demand in the freelance work market. Also research about how much you can earn by freelancing, prospective employers and median pay-scales for your qualifications and experience. Hone and fine-tune skills frequently while acquiring new ones that support your freelance work. Experts are in demand and hence attract much higher pay. Position your skills in a manner that attract the highest demand. Indentifying the niche industry you wish to serve is important since it better helps to pitch your skills. Nowadays, almost every industry posts its requirements for freelancers online. To get maximum contracts or work, you need to register yourself on some very reputed freelance website. A simple search on the Internet will reveal several freelance work portals. Along with details including name, qualification and contact details, specifically mention academic qualifications, work experience, special skills and unclassified information of projects executed either at full-time work or as freelancer. While registering, take your skills and experience into account. The choice of registering online as a specialized freelancer or in the ‘general’ category is solely yours. Generally, specialists get more pay since you can get hired for some exclusive project. The flipside is, specialist jobs are often fewer than the ‘general’ category. Before you define your services, be clear about the type of tasks you wish to undertake and those best avoided. Also consider the time you will spend on work: A specialist job may pay more but involve long hours while a general one would pay lower yet get completed quickly, leaving you time for more work and extra earnings. Something most freelancers neglect is fixing a price tag for services. Often, they skip fixing a price for fears of bagging few contracts or losing to those quoting low prices. As explained earlier, it is best to acquaint yourself with median prices for freelance jobs in your specialization. It is a myth that employers choose lowest bidders: With proper blend of skills and experience, you can get a freelance contract for higher pay. We would also advise blogging. However, to blogs, you require great writing skills combined with time and patience. If possible, write interesting content about your specialization and projects, ideal employers for freelancers and other stuff related to your field. Alternatively, you can deploy social media to your advantage. The best is Facebook Business. Keep friends and contacts posted about latest developments in your industry and add your observations. Also invite comments from your social network. Creating videos for YouTube, Pinterest and Instagram is also a great way to attract more clientele. However, as professional, it is vital to get on LinkedIn, which allows you to network easily with companies and other professionals in your field. You can also apply freelance jobs over LinkedIn through its various apps and extensions. Word of mouth publicity is also something most freelancers tend to neglect. Keep a great network of references ready that can vouch for your work integrity and superior quality. Often, companies looking for freelancers ask references. They may not contact any person you provide as reference. However, good references create a better impression through your CV while looking for freelance jobs. For projects completed, try obtaining letters of appreciation and recommendations, wherever possible. These come handy while dealing with picky employers or in situations where fierce competition exists for a single yet coveted freelance post. Due to rising popularity of freelance work, there are several local, national and international associations that bring freelancers together from diverse sectors. Joining such associations and guilds keeps you informed about latest trends in your industry, conditions and developments in your native land as well as foreign countries, government policies, existing pay scales and other data that helps you pitch yourself better during job searches. Attend lectures and gatherings wherever and whenever possible, which increases your network of peers and professionals. Often, you will come across freelance contracts that time consuming and may require long work hours. Regardless, never settle for a single contract. Ensure you have at least two or three more contracts that are easier to complete and can be done in some spare time. Preferably, such easier contracts should be of shorter duration that ensures you are financially stable. Offer astute and realistic deadlines to your employer. These are vital for every freelancer looking at working for large corporations. Often, employers demand freelancer complete time within deadlines that can prove too short. Never commit to any deadline unless you are absolutely sure of delivering the required work within the stipulated time. Missing deadlines can cause you to lose time, money and effort while creating a negative impression in the freelance market.